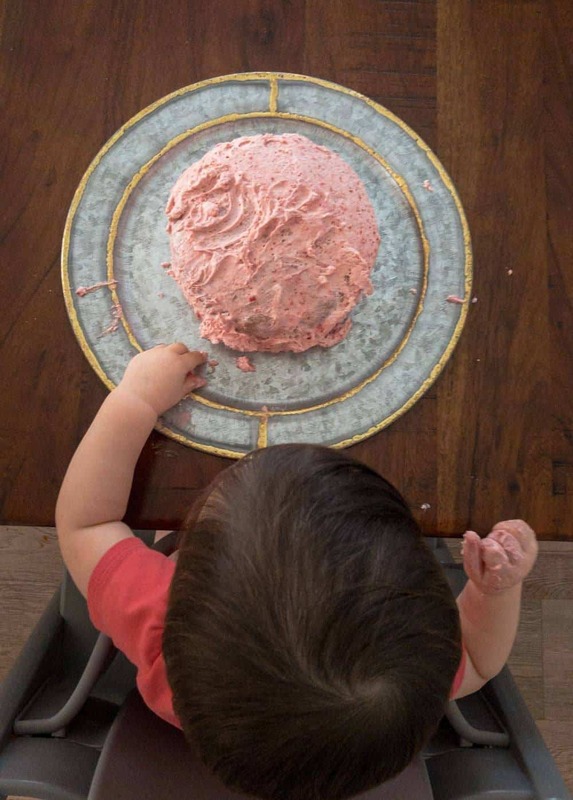 When we first started planning my daughter’s recent 1st birthday party, I had no intention of creating my own smash cake recipe. I figured why re-invent the wheel? I was planning to find one on Pinterest and call it a day. But when I actually went to find a recipe, I realized I wouldn’t be reinventing the wheel, because there wasn’t already one out there! I couldn't for the life of me find a fruit-sweetened smash cake that looked worth making. There were smash cakes with all sorts of random ingredients, as well as ones with tons of sugar. Lots of adorable ones that were clearly professionally made, and just too fancy for us. There were also those that said no sugar, but had maple syrup, or honey, or whatever other combination of non-sugar sweeteners you can come up with. All of which at the end of the day are pretty much the exact same thing as sugar! I have absolutely nothing against sugar, and my daughter won’t be restricted from sugar at all. But I also see absolutely no need to give sugar in a first birthday cake when my daughter doesn’t know what it is, and has no need for, or interest in it, to begin with. I’m all for pushing off the parade of sweet things until much later! So with that in mind, I was looking for a birthday cake with no sweeteners other than fruit, and no questionable or unnecessary ingredients. So when it comes down to it…a muffin really! And as with all my recipes for babies, I wanted to enjoy eating it myself. Enter this cake. I had been working on a muffin recipe for awhile, but just never managed to get it quite right. When I started thinking about it more from a cake side, it became clear what the recipe should be! This cake is sweetened with bananas, but I wanted something more than that for the main flavor. Fresh fruit didn’t give enough flavor throughout the cake, but freeze dried fruit did! I had some freeze dried strawberries hanging around in my pantry, and they turned out to be the perfect addition. They impart a bit of a sweet and sour flavor to the cake, and really take it to the next level. I haven’t tried it with any other fruits yet, because we liked how the strawberries tasted so much, but I’m sure others would work, too. As for the frosting, I tried a couple of different sugar free variations. Keep in mind, one of my goals for this cake was that I wanted to eat it, too! The winner, by far, was fresh whipped cream. No stabilizers or sugar needed, but I did throw in some of the freeze dried strawberries, and it became one of my favorite frostings! So many frostings are much too sweet for me, so this one is right up my alley! It has that same sweet yet slightly sour flavor as the cake does, and just adds so much! It makes it a fun pink color, too. One of my favorite things about this recipe is that it is by no means limited to a smash cake! It would be great as muffins, or as a type of banana bread. Without the frosting, of course. 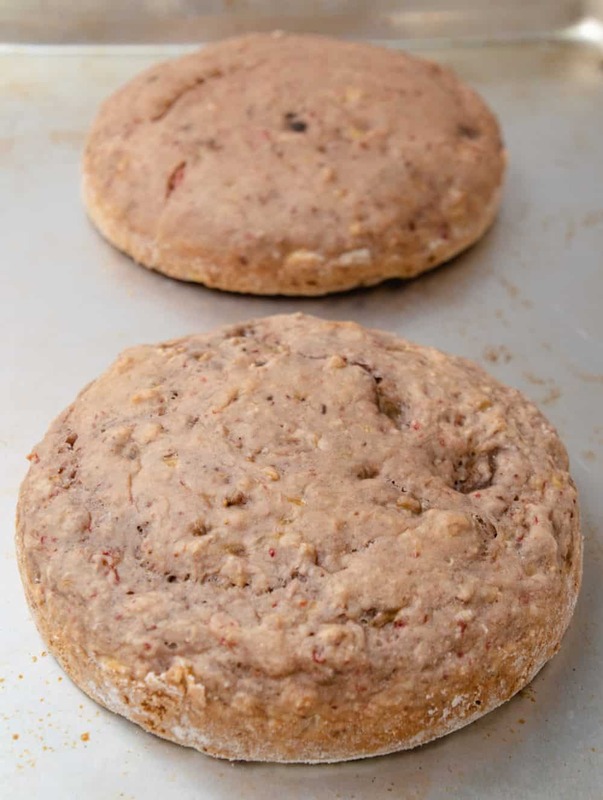 I trialed this recipe with white whole wheat flour, and while I didn’t like the end result as much when my goal was a cake, it would make a great muffin. Some of my trials definitely ended up as muffins for our breakfasts! 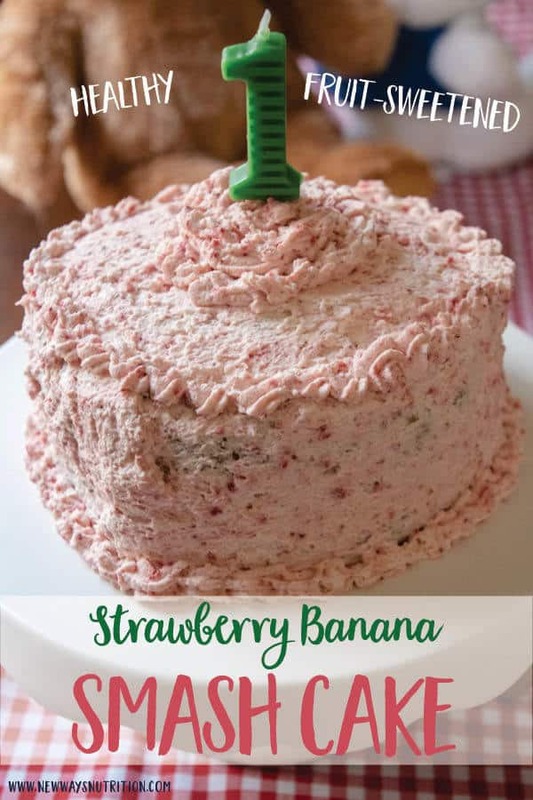 Strawberry and banana cake with a whipped cream frosting. Perfect for baby, delicious for parents, too! Preheat oven to 350F. Prepare two 6" cake pans by placing parchment paper in the bottom of them. Grease and flour the parchment paper and sides to prevent the cake from sticking and ensure an even surface. Combine dry ingredients in a medium size bowl. Set aside. In a small bowl, mash bananas with a fork until they are a fairly smooth puree texture. Add freeze dried strawberries to a zip-loc bag and seal. 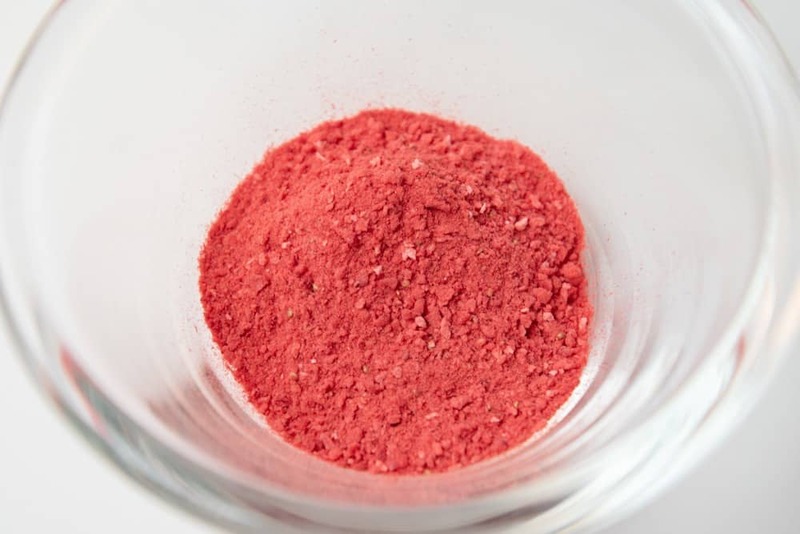 Use a rolling pin or a drinking glass to crush the strawberries into a fine powder. Some bigger chunks are ok, but you want them as small as possible. Add powdered strawberries and remaining wet ingredients to the bananas and mix thoroughly. Add wet ingredients to dry. Mix until just combined. Remove pans from oven. Let cool in pan for five minutes before running a knife around the edges to remove the cakes from the pans. Place on a wire rack to cool completely. Add whipping cream to the bowl of a mixer, and beat on medium to high speed (depending on your mixer) until stiff peaks form. For best results, place your bowl and beaters into the freezer to cool before beating. Add sliced strawberries to the zip-loc bag and crush into powder, as above. If you plan to use a piping tip for your cake, be sure to crush the strawberries into a very fine powder or they will block your tip. 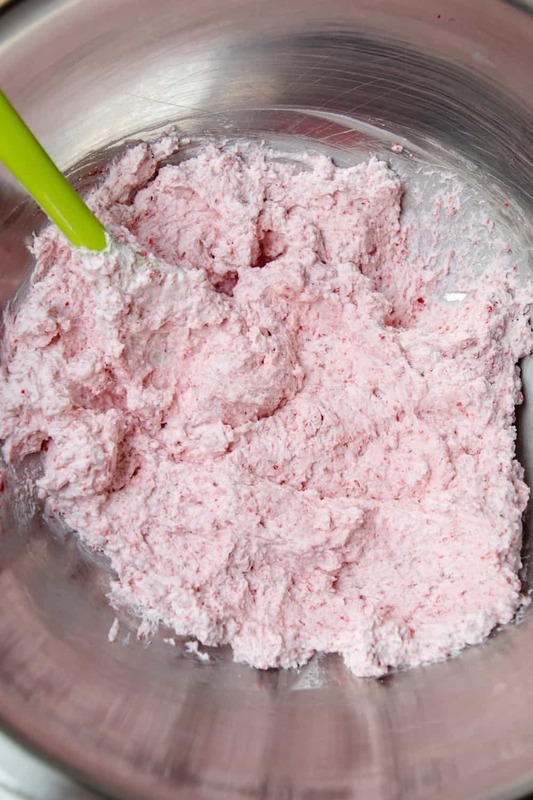 Gently fold powdered strawberries into whipped cream until evenly dispersed. Start with two tbsp, adding more to taste. Place one completely cooled layer onto a plate. Ensure the top is level by slicing off any domed area. Add a spoonful of frosting to the top of the bottom layer and spread evenly. Place the next cake layer on top. Use the remaining frosting to cover all cake surfaces. Pipe decoration around the edges and top if desired. The recipe makes enough frosting to cover the cake generously, if you plan to do a lot of decorative work you will need to increase the amount of frosting. Keep the finished cake in the refrigerator until ready to serve.